This 2-day course prepares individuals and teams to work in an Agile environment. You will learn what Agile approaches are about and how they can be successfully applied in the real-world. This highly interactive course provides an introduction to Agile theory, concepts, principles, and roles and responsibilities, as well as hands-on practice with common techniques from Scrum to iteratively plan, incrementally deliver, and inspect & adapt products and processes. 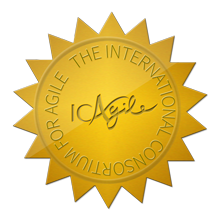 Successful completion of this course results in the ICAgile Certified Professional (ICP) certification from the International Consortium for Agile (ICAgile). Project and Program Managers, Team Leads, Product Owners, Scrum Masters, Business Analysts, Developers, Testers, and other individuals who are or will be working in an Agile environment or are responsible for managing solution delivery. This class is ideal for teams, giving you hands on practice to bring back to the workplace. Bring your team to learn and experience together!